Refried beans is a dish of cooked and mashed beans and is a traditional staple of Mexican, Tex-Mex cuisine, although each cuisine has a different approach when making the dish. Refried beans are also popular in many other Latin countries. The name is based on a mistranslation. In Mexican Spanish, the prefix re is an informal form of emphasis meaning "very" or "well", not to be confused with the English re and the most common use of the Spanish prefix re outside Mexico, which indicates repetition. Thus, frijoles refritos, the Mexican name of this dish, should translate to English as "well-fried beans", not "refried beans". In this dish, the beans are often fried, but may also be baked, thus making the term "refried" a misnomer on two counts. I received the Liebster award from Diane of The Hidden Pantry. Thanks so much for the honor. You made my day. In sauce pan, over low heat, combine refried beans and green chiles, heat through. In skillet, over medium heat, add ground beef and taco seasoning mix, breaking meat up as it cooks, cook until no longer pink. To assemble, spread refried beans mixture on pizza crust, then add ground beef and sprinkle cheddar cheese over top. Place in oven and cook about 10 to 13 minutes, until cheese melted. Remove pizza from oven and sprinkle onions and tomatoes. Slice and serve. Enjoy! Note: Nothing fancy about it. You can dress it up however you like, play around and have fun. This pizza would be great for game day. Y'all have fun on Sunday! It looks absolutely delicious. I know my family would be all over a pizza like that! Mexican pizzas are a great weeknight rush meal. So filling! looks so good Christine! I love any type of Mexican food & this looks so great! I think this is one dish that would work very well as a vegetarian dish too--minus the beef. Nice! Ooh--did you serve this yesterday? This is perfect Super Bowl food! It looks like a quick and yummy weeknight dinner--I cannot get enough of Mexican flavors. No, I didn't serve Mexican pizza yesterday. It is a great Super Bowl food. yummy pizza!! 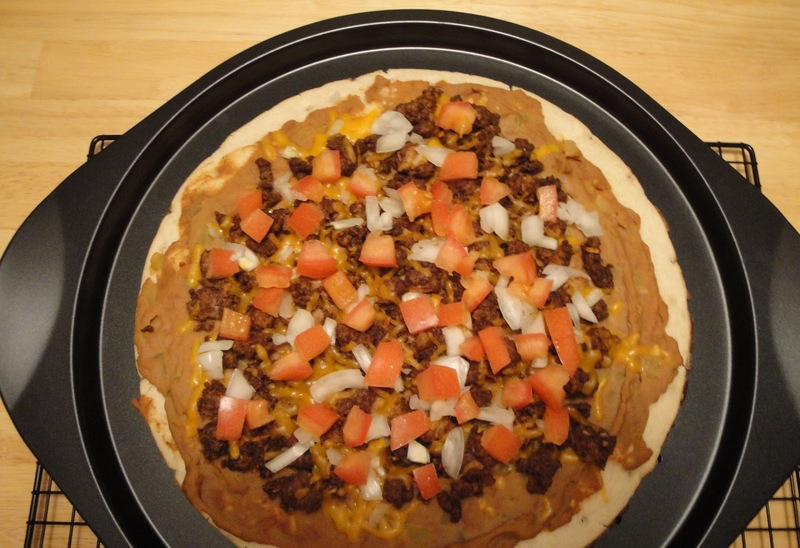 I love refried beans and make them with all types of beans, perfect for muy hubby! this pizza looks yummy! and well pizza is always good! i've never tried that kind, but i will have to cook it one day!